This full length portrait depicts doña Mariana Belsunse y Salasar, an elite Creole woman from Lima. 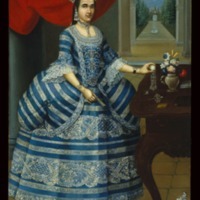 Doña Mariana, depicted almost life-size here, stares directly out at the viewer, outfitted in a sumptuous blue silk gown. The cascades of lace and ballooning dress show the bounty of fine fabric used in the outfits of high-status women. The style of the painting owes much to 18th-century conventions of portraiture in Spanish America (which, originally, drew upon and then reworked European models). For instance, the setting of the scene, the props on the table, and the pose of doña Mariana all appear in many portraits of the time. In 18th-century Peru, elaborate dresses trimmed and decorated with fine lace, in the style of this one, were often made of fabrics imported from Asia, New Spain and Europe. 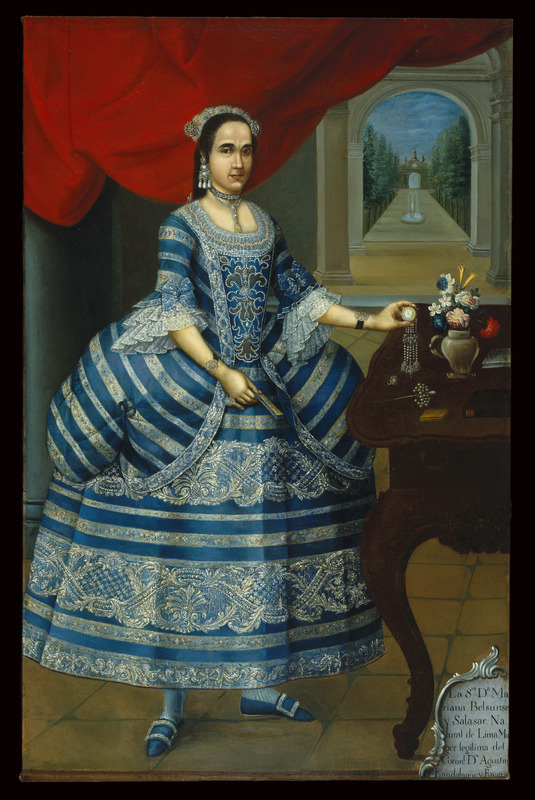 Doña Mariana's painted outfit thus testifies to the taste for luxury that Lima's elite developed in the colonial period, and to the diverse trade networks that fueled and sustained these tastes. Behind her, the crimson curtain was not an actual part of her house. It is a convention of 18th-century portrait painting, intended to suggest a stage set. In the background to the right appears an enclosed garden, with its tree-lined path. The enclosed garden is a metaphor for female chastity and often appears in paintings of the Virgin Mary, after whom doña Mariana was named. The watch doña Mariana holds evokes the passage of time and mortality, as do the cut flowers that appear in the vase on the table. The cartouche with text is a common feature of portraits from Spanish America. The text begins in standard fashion: La Senora Doña Mariana Belsunse y Salasar. Natural de Lima. Muger legitima del Coronel don Agustin Landol…(Lady Mariana Belsunse y Salasar, native of Lima, and legitimate wife of Colonel Agustin Landol...). At some point in time, the canvas was trimmed, and the text was truncated. The original text may have included doña Mariana’s birthdate and named her parents. Doña Mariana or her family commissioned this portrait. While the name of the painter is not known, the fine craftsmanship and use of well-known portraiture conventions suggest it was a man with an established reputation as a portrait painter, and a belonged to the painting guild in Lima. This painting was made of oil paint applied to canvas, the standard materials used in paintings created for European and Creole patrons in Spanish America. This painting devotes careful attention to doña Mariana's facial features, clothing, and jewelry, yet the image also adopts many standard features of portrait painting in 18th-century Spanish America. Among them are the curtain, table, watch and flowers, as well as doña Mariana's pose. In looking outward to establish eye contact with those who gaze upon her portrait, doña Mariana at once presents herself to the world and demonstrates her awareness of "fine" portrait painting. Doña Mariana was well-known to Lima's gossips for fleeing to a convent, rather than consummating an arranged marriage to an older man. After her husband's death, doña Mariana left the convent--a wealthy and virginal widow--to rejoin Lima's cosmopolitan life. Although we do not know the precise moment in doña Mariana's life depicted in this portrait, she appears as a young woman, in the clothing and setting of the wealthy Limeña (citizen of Lima). This implies the portrait was painted either before she entered the convent, or after she emerged. Portraits like this one hung in elite homes where they cemented ties between generations and among family members taken away by marriage, religious vows, or death. Portraits often captured elite women at the defining moments of their social lives, as young brides or convent novitiates. Hanging prominently in wealthy households, they were visual models of what paths elite women were expected to follow—wives of men, or brides of Christ. Thus they both documented and shaped social life. Brown, Michael. 2013. "Portraits and Patrons in the Colonial Americas." In Behind Closed Doors: Art in the Spanish American Home, ed. Richard Aste. Brooklyn: Brooklyn Museum of Art, 131-160. Fane, Diana, ed. 1996. Converging Cultures: Art and Identity in Spanish America. Brooklyn: The Brooklyn Museum and Harry Abrams. El retrato civil en la Nueva España. 1991. Mexico City: Museo de San Carlos.